St. Cecilia's was first established as a mission of St. Peter's Parish, Merchantville, in 1926, by Fr. John B. Conway, then pastor of the latter parish. Fr. Conway, working with the Catholic families who first settled in this North Merchantville area of Pennsauken, erected a combination church and school building on Camden Ave. The following year (1927), the mission opened the first three grades of its school with an enrollment of 82 students. The school was staffed by three of the Franciscan Sisters of Allegany from St. Peter's Convent. Following the creation of the new Diocese of Camden in December, 1937, Bishop Bartholomew J. Eustace, in January, 1939, established St. Cecilia Mission as a parish of his new diocese and designated the community of Delair as a mission of St. Cecilia's. Fr. (later Monsignor) Raymond J. Kavanagh was appointed the first pastor, within a short time two Associate Pastors were also assigned to the parish. Consisting of some 150 families. In February, 1939, a store was leased on River Rd., Delair, for the celebration of Mass for members of St. Veronica's Mission. Mass was celebrated there each Sunday thereafter until the facility could no longer accommodate the number wishing to attend. Services were then relocated to the local fire hall. Construction of a frame mission church of St. Veronica's was also begun in October and blessed by Bishop Eustace on Dec. 15, 1940. In May of the following year 12 children received First Holy Communion. At St. Cecilia's two more houses were leased in the spring of 1941, one on Browning Road to serve as a rectory and another on Lexington Ave., to be used as a convent. In the fall of the following year Fr. Kavanagh purchased the entire block opposite the church/school on Camden Ave., between 48th and 49th Sts., as the site for a proposed new convent and rectory. In the spring of 1943 a frame rectory was erected on the site and a frame addition to the church/school building, comprising additional classrooms, a stage, and a cafeteria, at a cost of some $18,000 was also completed. Construction of a new brick convent was begun in November, 1945, and completed the following August at a cost of some $47,000. Two shrines, one of the Crucifixion and the other to Our Lady of Lourdes were also placed on the parish grounds at this time. In September, 1952, construction of St. Cecilia's Church was begun. The cornerstone of the new brick building was laid the following November. Bishop Eustace officiated at the solemn Blessing it has a seating capacity of 900. By 1953, the parish had grown from its original 150 families to 1,200. The school had an enrollment of 500 students with a staff of 10 Sisters and two lay teachers. Mean while St. Veronica's Mission had grown from 50 to 125 families. The old rectory at 4824 Camden Ave., was demolished in March, 1958 and construction was started on a new rectory, completed the following August. In May, 1958, construction of a new school was begun. Completed the following December at a cost of $240,343, it housed 8 classrooms, auditorium, cafeteria, teachers' lounge, dispensary and administrative offices. The school presently has an enrollment of 200 students in grades K through eight. Due to the order's shortage of vocations, the Franciscan Sisters of Allegany withdrew from St. Cecilia's in 1986 and the school now has an all lay staff. The parish Religious Education (CCD) program numbers some 100 children. The school and parish youngsters have enjoyed an active athletic program in basketball, soccer, track and field and cheerleading through the direction of the St. Cecilia's Athletic Association for over 40 years. In 1996 the parish began a Child-Care program that is now housed in the former convent. The program consists of day care and before and after school programs as well as a summer camp. Over 75 children are enrolled in various aspects of the program. Due to a shift in demographics with many of our younger families moving in the surrounding suburbs, the parish enrollment has declined by 1/3 of its registered families a decade ago to some 800 families at present. At the same time, a growing Hispanic presence in the parish resulted in a new ministry to the Hispanic Community initiated in 2001 with the assignment of our part-time associate (Fr. Walter Guasp-Santos) and Deacon Miguel Rivera. A mass in Spanish was added in February 2003 and a door to door census-visitation is was established to help meet the specific needs of our new parishioners. A maintenance-beautification program was begun in 2002 and continues to enhance our facilities and provide a welcoming sign to all who pass our doors. Of special note are the water gardens at the church entrance and renovation work in our school, hall and kitchen area. In the Spring of 2005, Bishop Joseph Galante conducted "Speak-Up" Sessions with every parish in the diocese in order to gain an appreciation for the needs confronting parishes and their spiritual enrichment. In January of 2006 pastoral priorities were established and a Vision Statement created from these sessions helped to set the course for the next two years where pastoral plans emerged and the call for more vibrant, dynamic parishes resulted in ministries and programs offered on the Diocesan level. At the same time, every parish selected delegates to consider re-configuration of parishes to best meet their needs on the local or Deanery level. By the Spring of 2008, the Bishop took the recommendations of every parish and announced the intent to either merge parishes or allow some to stand alone to best serve the needs of their parishioners. In June of 2008, Bishop Galante met with parishioners at St. Cecilia's and in September announced the intended merger of St. Cecilia's with St. Veronica's Parish. A "Core" Team was established with representatives from both parishes led by the appointed "priest" convener, Fr. Bill Moore, to draft a plan for the merger and the blueprints of how the new parish would function. Parishioners' input was sought for a variety of measures including which ministries and organizations would best serve the new parish, the times for Mass Celebrations, and a new parish name. Fr. Moore was appointed Pastor of both St. Cecilia and St. Veronica's in May 2009. 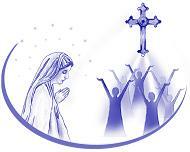 On November 4th, 2009, a decree was issued to formally establish the new parish of Mary, Queen of All Saints. Closing liturgies for St. Cecilia and St. Veronica were held the weekend of October 31st - November 1st, 2009 and a special opening liturgy for Mary, Queen of All Saints was celebrated with a Mass and reception on November 8th, 2009. The land and Church of St. Veronica's was sold in July 2010, and the former St. Cecilia Church and grounds continues to serve the newly established parish of Mary, Queen of All Saints.